Geography (or spatial arrangement) of nodes is often an important factor in network dynamics. Though it is straightforward to map geographical information by itself, mapping that information simultaneously with network data is quite a challenge. 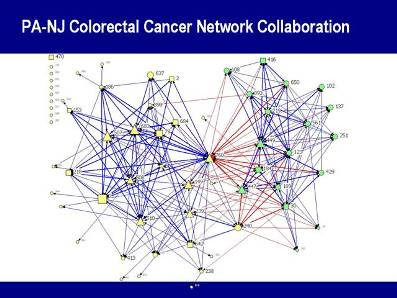 In collaboration with Holly Massett and her team at the National Cancer Institute, I have been tackling the geographic + network mapping problem head on. Holly and I recently presented some of our results, and she graciously gave me permission to share them. Now we can clearly see that there is one node that bridges between two distinct clusters. I'm sure there's a good way of visualizing geographic network data. Maybe a cartogram of sorts? A bipartite network? Weight the distances between nodes based on geographic distance somehow? The problem is that social networks are very weakly connected to geography. I don't know of any papers that try to resolve this... low hanging fruit anyone? To visualize the network interconnections within a geographic framework, one possibility is to use graduated node sizes (varying by the number of input edges), line coloration or differing widths (varying by hierarchical order). In response to Aftersox's comment about the connection between networks and geography, I recently came across a very interesting paper that does try to address this, How relevant are features for network structure?" by Ginestra Bianconi, Paolo Pin, Matteo Marsili. One of the applications of the new measure they create is to measure the connection between the network of airplane flights and the geographical position of airports. I wonder if anyone has seen this paper or has thoughts on it?